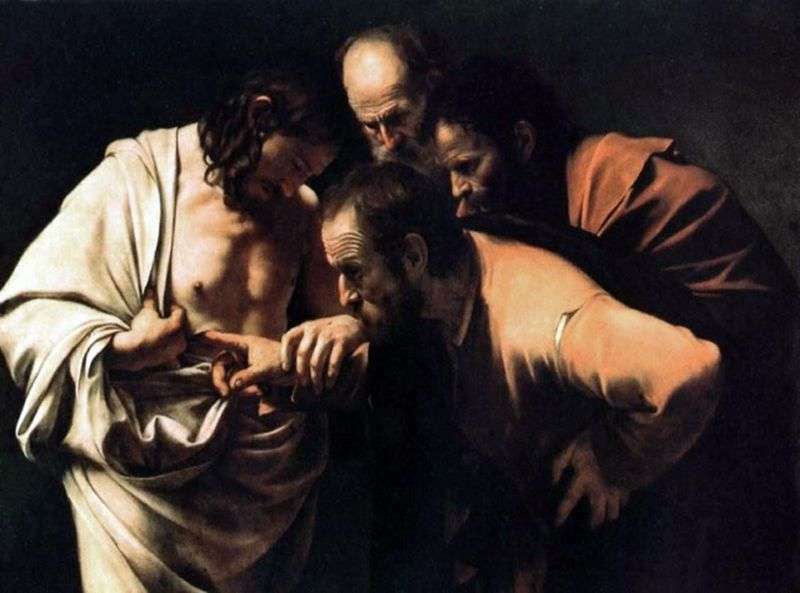 Painting of the Italian painter Caravaggio “Confidence of Thomas”. The size of the picture is 107 x 146 cm, canvas, oil. In his painting, Caravaggio depicted how Saint Thomas touches the wounds of the crucified Christ, in order to make sure of their reality. The heads of Christ and the three apostles are the focus of composition. There is a tense moment when the apostles look at St. Thomas with a brow furrowed with deep wrinkles, while he puts a finger in the body of Christ. The dramatic nature of this strikingly realistic detail is amplified by a sharp light and deep shadows; the background is missing. Caravaggio became famous as a bright realist who rejected idealization; such a path in art was revolutionary at that time. He often used crude peasant types as models for saints and apostles and, they say, even wrote one of his Madonna with a drowned prostitute whose body was extracted from the Tiber. Despite his dubious reputation as a man, Caravaggio almost single-handedly revolutionized art. Even today, the paintings of the artist Merisi and Caravaggio have amazing power and direct impact. Description and meaning of the painting Confidence of Thomas by Michelangelo Merisi and Caravaggio.